The Caribbean Literary Heritage project “is concerned with the Caribbean literary past and the region’s tangible and intangible literary heritage. It is particularly interested in neglected writers and writings at risk of being lost, and in thinking about what influences such precarity.” I believe that my father is an exemplar of why the Caribbean Literary Heritage project is so important and rich in possibilities. 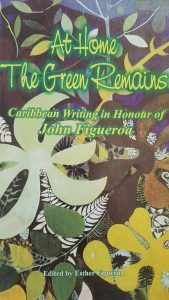 John Figueroa was a writer, poet, educator, anthologist, journalist, radio broadcaster, sports commentator (particularly of cricket), linguist, literary critic, promoter of literature, culture and the arts, and a friend and mentor to many of the Caribbean’s best known writers particularly Derek Walcott and George Lamming. He was integrally part of the literary generation that, beginning in the 1940s, came to define Anglophone Caribbean writing. A participant in the famous BBC Caribbean Voices radio series, as a contributor, reader and recommender of talent, he helped to bring some of these voices into print by publishing two volumes of West Indian poetry from the programme entitled Caribbean Voices (Evans, 1970). [ii] With my mother, Dorothy Alexander Figueroa, he compiled a bibliography of Anglophone Literature from the Caribbean: Caribbean Writers: A Bio-Bibliographical Critical Encyclopedia (Three Continents Press, 1979). He later edited An Anthology of African and Caribbean Writing in English (Heinemann, 1987) as part of his work developing the Third World Studies program at the Open University. 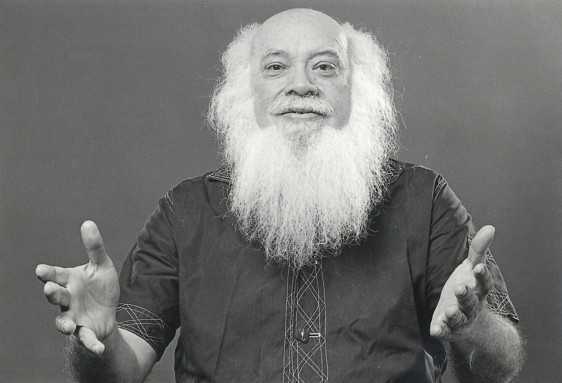 Across his career supporting the work of other Caribbean writers and establishing the foundations for scholarly engagement, he published four collections of his own poetry: Blue Mountain Peak (The Gleaner Company, 1945), Love Leaps Here (C. Tinling and Co Ltd, 1962), Ignoring Hurts (Three Continents Press, 1976) and The Chase (Peepal Tree Press, 1991). 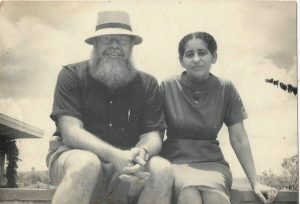 John Figueroa and Dorothy Alexander Figueroa, 1961 at Knox College, Jamaica. They were married 3rd August, 1944 until death did part in March and May of 1999. His life began in Kingston, Jamaica and ended in Milton Keynes, England. In between he lived in Jamaica, North America, England, Puerto Rico, Nigeria, and travelled widely throughout the Caribbean, North America, Latin America, Africa and Europe. He called himself “un hombre del Caribe” (a man of the Caribbean) because he identified with an entire region and hated nationalism, jingoism and prejudice. In 1946, with a British Council scholarship he studied at the Institute of Education and London University and went on to lecture in English and Philosophy there. He returned to Jamaica in 1953 as Senior Lecturer in the Department of Education at the then University College of the West Indies (later the University of the West Indies), and in 1957 became the first West Indian to be appointed as chair in any discipline. Prof, as he was known, was one of the Caribbean’s most influential educators, developing educational policy and curriculum, training teachers and inspecting schools throughout the Caribbean. His influence as an educator in promoting the teaching of Caribbean Literature is immense. 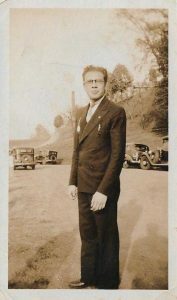 My father, the eldest of the thirteen children (ten of whom survived infancy) of Blanche Maria Palomino and Rupert Aston Figueroa, was a devout Roman Catholic of Jewish-Catholic Hispanic heritage with European, African and Amerindian origins. He had a Jesuit education first at St. George’s College (Kingston, Jamaica) then Holy Cross College (Massachusetts, USA). He studied the classics and could read Greek and Latin. The thesis of his MPhil from London University was on Caritas in education – arguing that education should be built on love and caring. His poetry is filled with religious and classical references. Some reviewers dismissed his poetry as “pastoral”. His early poetry was very conventional in style but this changed in later years. It is deeply personal and, like himself, quite emotional. In 1971, he left Jamaica for Puerto Rico (where he went on to establish the Center for Caribbean Studies) and then on to Nigeria where from 1976-1980 he was Professor of Education at the University of Jos. In 1980, he returned to the UK as visiting professor at Bradford College and then worked at the Open University as part of their Third World Studies team. The last twenty years of his life were based in England and during that period he became more and more forgotten in Jamaica. His work was better remembered in the Eastern Caribbean and the UK. [iii] And with few exceptions, his work has been left out of the major canon of Caribbean writing. Despite the inclusion of his work in a recent collection of Jamaican poets selected by Mervyn Morris, his friend and former poet laureate of Jamaica, my promise to my father that he is not forgotten becomes more and more tenuous. 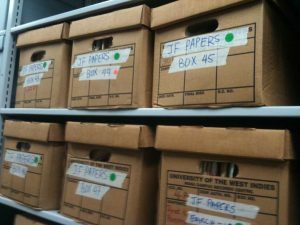 As his literary executor, I donated my father’s papers to the University of the West Indies Mona and there are now two John Figueroa collections: one housed at the UWI Archive, the other at the West Indies Collection at the Library. These collections include my father’s memoir and other biographical writings such as journals, including from his trip from northern to southern Africa; manuscripts of his published works; an unpublished manuscript of a book he wrote about Derek Walcott’s writing; other writing about Walcott as well as poetry Derek sent him; papers pertaining to the BBC Caribbean Voices series; personal correspondence including letters to/about such literary giants as Derek Walcott, George Lamming, Frank Collymore, and V. S. Naipaul; his thesis on Caritas; papers, lectures and presentations on education, linguistics, philosophy, literature, nation-building, cricket, sports, by himself and others; poetry, fiction and plays written by himself and others; newspaper clippings over a range of topics; internal UWI papers, memos, letters, examinations, etc. ; materials relating to his course development at the Open University Third World Studies; family correspondence and papers; postcards from across the world; audio visual materials, and much more. Due to lack of resources, neither collection has been properly sorted, organized or catalogued as yet. 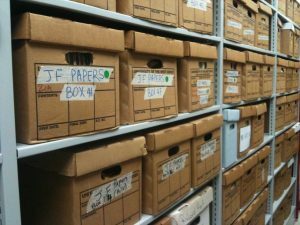 The collection in the archive is properly housed, shelved, and a general description is available. But the collection in the Library has only recently been opened for a preliminary investigation of its contents. If you are interested in researching materials within the John Figueroa Collections you will need to write a letter to the archive or library stating your position and the nature and intended outputs of your research. If you are affiliated with an institution or a project, a supporting letter from that institution or project needs to be included as well. When you are planning to visit the collections, please first contact me and I will provide you with current contact information as to the persons to whom you will need to email your request for access. If you have any questions or would like more information please contact me, Esther Figueroa, at vagabondmedia1@mac.com. Esther Figueroa, Ph.D., is an independent filmmaker, writer, educator and linguist. Beginning in the early 1980s, she has produced television programming, documentaries, educational videos, multimedia and feature film. Her films include Jamaica for Sale (2009), the award-winning feature documentary about tourism and unsustainable development. Her latest feature documentary Fly Me To The Moon (2019), is about the role of aluminum in the making of the modern world and the centrality of the Caribbean to that modernity. Her publications include Sociolinguistic Metatheory (1994), At Home the Green Remains (2003), and her environmental novel Limbo (2013). [ii] See Philip Nanton’s interview with JJF about Caribbean Voices, https://tandfonline.com/doi/abs/10.1080/00086495.2003.11672185?journalCode=rcbq20.